All book proceeds will be donated to a fund for crash victims and their families. 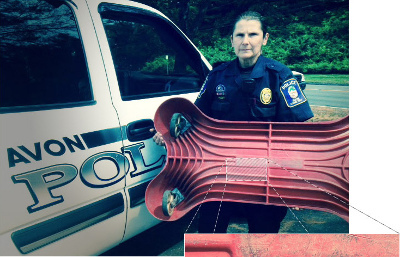 Shortly after the tragedy, Avon Police Officer Sue Kassey wrote this message on the underside of the "mechanic's creeper" she uses to inspect trucks. Since the crash, Officer Kassey has stopped thousands of trucks and removed nearly half from the road due to serious safety violations. For more details, see Smoke, Fire and Angels, Chapter 15, "Never Forget." 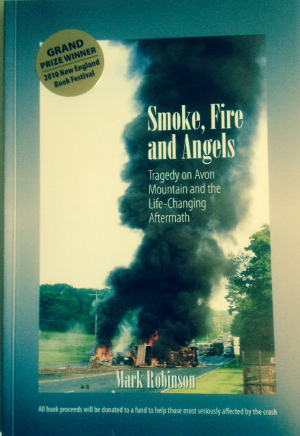 Smoke, Fire and Angels is a true story, the best and most irresponsible among us. It's about what happened before, during and after one of the worst crashes in Connecticut history. It's about innocent victims and heroes - everyday people who did extraordinary things, literally picking up the pieces of the broken lives left in the wake of a poorly maintained, uninsured, fully loaded, out-of control Mack dump truck. © COPYRIGHT 2019 Mark Robinson , Canton, CT - ALL RIGHTS RESERVED.